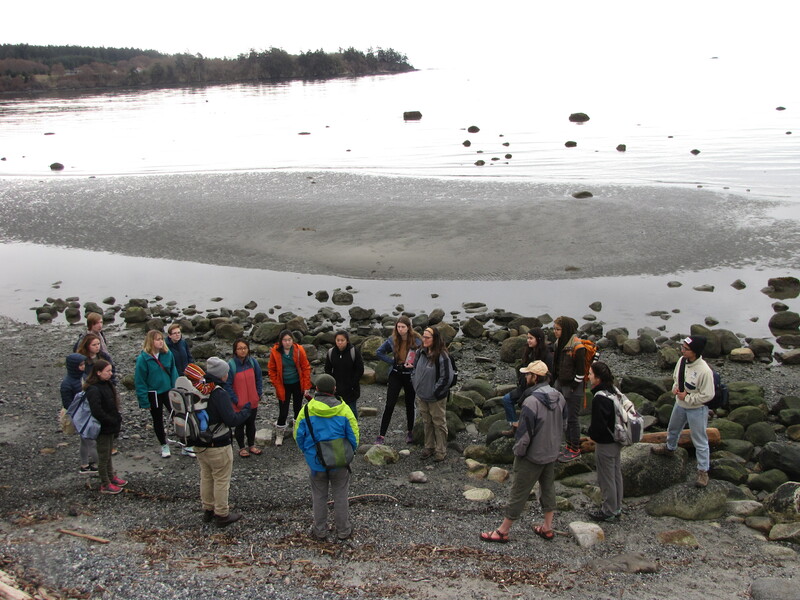 Ecopoetics Along Shorelines is an interdisciplinary seminar and field writing lab. This course draws together theories and practices from ecological science, Indigenous studies, environmental humanities, hydrology, cultural studies, science and technology studies (STS), critical theory, and poetry. There are two segments: a weekly seminar and writing practicum, and a weekly studio. You’ll also work independently all quarter at your own chosen field site. In the seminar and practicum, we immerse ourselves in diverse ecopoetic visions, and probe varied theories of relation. We explore shadow histories of Seattle area waterways, examining historic maps, oral histories, engineering drawings, and on-the-ground legacies of drainage projects. We trace buried creeks, gutters, and storm drains of Seattle, examine Salish inhabitation through place names, and address human health impacts of urban runoff. We develop apparatus for investigating buried flows. We contemplate post-sea-level-rise futures in which the city becomes an archipelago. In the field and studio portions of class, we will spend many hours observing, writing, and sketching. We will practice close attention to shoreline processes and seasonal rhythms, explore biotic communities and historical sites, and compose odes to creatures in the University collections. We will converse with the field work of artists and scientists. We will work from archives of texts and maps from different eras on boats, navigation, and inter-island commerce. Studio provides space for developing your shoreline relational art. Through these extended explorations of local shorelines, you will be plunged into your own poetics of relation to local waters. You will place your field observations and creative and scientific writing into dialog with texts ranging from Indigenous poetics and queer feminist theory to European explorers’ logs and floodplain engineering documents. You will produce poetic and scientific writing, maps, and collage. The course will conclude with a public delivery of projects along the Montlake Cut / Lake Washington shoreline. Please acquire your own hard copies of the reader and of all required books. This is important to us in part so that all readings are readily portable for reading in the field, and in part for ease of reference in the classroom. We ask all class members to hold space for engaged conversation and focused writing, and to cultivate attention and deliberate presence. One way we work toward this is to propose the classroom be “longhand”—to use notebooks and handwritten notes, and avoid the use of laptops and other electronic devices wherever possible. Unless you need these devices, of course! Meet with us if you do, and we will work out an accommodation. You will keep a field journal with three entries per week, logging and reflecting on shoreline relations. Field journals are a standard for field scientists like geologists, botanists, and wildlife biologists—as lab journals have been for laboratory scientists. But similar journals make up a crucial practice for poets, artists, and travelers as well. You might find inspiration from any of these traditions. Every week, you’ll hand in 2 discussion questions. Your questions should not only spring from the readings, but also send us to the text again for a deeper or shifted exploration. These assignments will be graded on thoughtful selection of quote, clarity of writing, and quality of the question. They are due via Canvas and in hard copy each week. You’ll compose something to bring to the water’s edge: a performance piece, dance, audio installation, musical work, sculpture, or other artistic creation. Time-based projects should take no more than 5 minutes, and be repeatable. Your project should engage deeply with associations or relations along shorelines or edges. Here you will ground your creative work in course texts and guest presentations. We envision this as an outgrowth of your proposal and presentation, augmented with a tracing of influences, some theoretical provocations, and an account of scholarly conversations to which your creative project contributes. Milestones keep your projects developing over the course of the quarter. In week 5, you’ll propose a choice of sources and genres to a peer review group, along with a rough sketch of methods or approaches. In week 7, you’ll present a peer review group with your titles, themes, and a promising glimpse of your projects. In week 9, you’ll turn in final drafts of your Critical Work and your Chosen Writing. We’ll get them back to you with feedback for revision, and you’ll submit revised work by the end of week 10. Proposed methods and justification, description of the justice dimension, proposed format of relational art, abstract of critical documentation, and bibliography. The work of seminar is shared inquiry into unfamiliar territory. While each class session contains its own discussion, we also sustain our collective conversation across the whole quarter. Attentive reading, clear thought, inspired listening, and generosity of spirit are the lifeblood of the seminar. All participants shape the conversation, through response to the guiding questions, but also, crucially, by asking probing questions of others, by incorporating and extending others’ thoughts, by turning to the text for example—and most often by listening carefully as others speak. Please come to class prepared, having done the week’s readings and your field writing, and ready to talk and write and share. During seminar, we ask all class members to hold space for engaged conversation and listening, and to cultivate attention and deliberate presence. Sometime in the first three weeks of class, bring a conversation to one of us in office hours. We expect graduate student writing, seminar contributions, and final projects to reflect their advanced level of study, and will grade accordingly. In weeks when undergraduate students are assigned selections from a course text, graduate students are expected to read at least one additional chapter of their choice, and are encouraged to read the entire text if it is closely aligned with their scholarly interests. Finally, graduate students will submit an additional final work, relating the relations they explore to one of their fields of study; we’ll give more detail in the assignment sheet for the final project. So, a 6 would meet all the requirements of an assignment; a 9 would be a strong and thoughtful showing; and a 12 would go beyond our expectations in delightful and striking ways. A 3 might be incomplete, or off-topic, or clearly unsatisfactory in other ways. Your experience in this class is important to us. Also, it is the policy and practice of the University of Washington to create inclusive and accessible learning environments consistent with federal and state law. In addition to normal accommodations you may expect from every classroom-based class, the field work may present more barriers to access. Please let us know at or soon after the first class if you require accommodations in the field! We will work outdoors weekly, and take a field trip. If you experience barriers to access due to a temporary health condition or permanent disability (conditions include but not limited to; mental health, attention-related, learning, vision, hearing, physical or health impacts), and require accommodations, please contact Disability Resources for Students (DRS) at 425-352-5307 or uwbdrs@uw.edu. If you have already established accommodations with DRS, please communicate your approved accommodations to us at your earliest convenience so we can discuss your needs in this course. DRS offers resources and coordinates reasonable accommodations for students with disabilities and/or temporary health conditions. Reasonable accommodations are established through an interactive process between you, your instructor(s), and DRS. and expanded on here: https://depts.washington.edu/pswrite/plag.html. We will also upload the University’s statement on Academic Responsibility to our Canvas site. Anytime you are unsure of your practices, talk to us, or to a writing studio tutor, librarian, or other knowledgeable authority.